Thornage is a small parish situated in the North Norfolk Local Government District. It has an area of some 510 hectares, and contains the settlements of Thornage and and Little Thornage. There are a few small plantations, but the parish is dominated by agricultural land, and is just 4km southwest from Holt. The word ‘Thornage’ is thought to derive from the Old English for pasture where thorns grow. The earliest recorded monument from the parish is a prehistoric pit (NHER 6490) containing a number of pot boilers and worked flints, which was excavated 1996 on a site where a large number of pot boilers and worked flints had already been recovered. Other concentrations of prehistoric objects have been recorded (NHER 33563), as well as a number of prehistoric worked flints (NHER 15734 and 17319). In addition to this are four Neolithic axeheads (NHER 28670, 31985 and 31986), a scraper (NHER 31496) and a Neolithic plano-convex knife (NHER 6490). Of particular interest is a possible Early Bronze Age spiral headed pin (NHER 22866) and a concentration of Late Bronze Age flint tools (NHER 32285). The cropmark of a possible Bronze Age ring ditch (NHER 11722) has also been noted. No monuments from the Roman period have been recorded, although a small number of objects have been noted. These comprise coins (NHER 6491, 6492 and 17319), pottery sherds (NHER 31184 and 33563), and a mirror fragment (NHER 36998). A number of Saxon objects have also been recovered. These include Middle to Late Saxon pottery sherds and strap fitting (NHER 17319), a mount from an Early Saxon drinking horn or vessel and a Late Saxon box mount (NHER 31596) and a Late Saxon bead or censer attachment (NHER 36998). Thornage is also listed in the Domesday Book of 1086, and although it does not seem to be particularly populous or valuable, the settlement does have a church. It seems likely that this refers to the present All Saint’s Church (NHER 3172), which is thought to have possible Saxon period long-and-short masonry work in the northwest corner. The church itself was heavily restored in 1898, but three Norman windows are still visible in the nave and chancel. The only other surviving medieval building is Thornage Hall (NHER 3173), which is a former grange of the Bishops of Norwich. The present building was initially constructed around 1482 for Bishop Goldwell, contains reused stone fragments from the 12th and 13th centuries, and was altered in the 17th century. A small number of objects from the medieval period have also been recovered, and these include pottery sherds (NHER 6493, 18288 and 31184) and coins (NHER 31596). 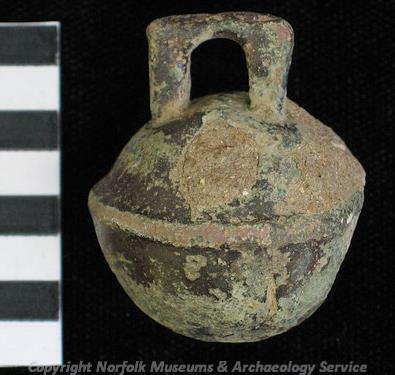 Other objects of interest are a harness pendant (NHER 17319) and a vessel fragment (NHER 36998). There are also a number of post medieval building of architectural interest in the parish. These include Brecks Farmhouse, barn and cartshed (NHER 20935), a set of brick buildings constructed around 1800, and Town Farmhouse and barn (NHER 22428), a 17th century building with 19th century additions and large 17th century fireplaces. From the industrial past Thornage Watermill (NHER 6527), a late 18th or early 19th century three storey mill, is still standing, and the building which was the Thornage Brass and Iron Foundry Co site (NHER 23499) during the 19th century also survives.